We were honoured to be asked by the Hospital management to broadcast to the wards the opening of the new Dorset County Hospital by Her Majesty the Queen. We were able to broadcast this live with commentators at the approach road to the hospital to describe the scene as the Royal motorcade made its way towards the buildings, and in the Courtyard where The Queen unveiled a commemerative plaque and gave a short address. This was anchored by a presenter in the studio and the commentaries were interspersed with music from the year of the Coronation, 1953, plus our own archive recordings of memories of that great day - notably from Godfrey Talbot who was BBC Radio's Coronation commentator and Lord Fisher of Lambeth who, as Archbishop of Canterbury at the time, crowned the Queen. Altogether this made a 3 hour programme which were very proud to have produced and, being live, might be unique in hospital radio terms. 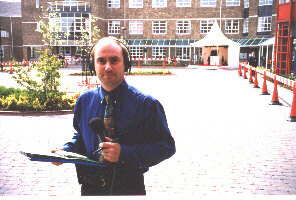 Rob Mott, pictured left, at his commentary position in the courtyard preparing for the broadcast. Ridgeway Radio's chairman Andy Worth, pictured right, is interviewed by Doug Ross on the platform after the unveiling ceremony - earlier Andy had been presented to the Queen along with Hospital staff and local dignitaries. A hot (and bothered? - never!) studio presenter, Andy Venton, reaches for another gin....er, sorry...Coke. 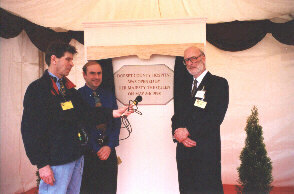 Her Majesty The Queen officially opened Phase 2 of the Dorset County Hospital, on Friday 8th May 1998. 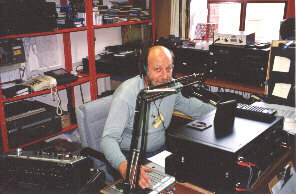 Ridgeway Radio provided patients with full live coverage of this historic event.